The military commands in both the US and Britain have sought increased funding and stepped up deployments of arms and personnel to the Persian Gulf in preparation for an anticipated war against Iran. The Journal cast these preparations as defensive measures aimed at countering an Iranian threat to close the Strait of Hormuz, the waterway through which some 20 percent of the world’s exported oil flows. Iran’s threat came in response to trade sanctions and embargoes imposed by the US and Western Europe that amount to a blockade, an act of war, as well as open Israeli threats to bomb the country. Under the Pentagon’s plans, US warships would be equipped with anti-tank weapons, rapid-fire machine guns and light weapons for use against the Iranian navy’s small speedboats. They would be backed by increased numbers of unmanned drones. The US has already doubled the number of aircraft carrier battle groups it has stationed in the Persian Gulf area, deploying both the USS Abraham Lincoln and the USS Carl Vinson. It also has substantial numbers of warplanes operating out of the Arabian Peninsula and tens of thousands of troops near Iran’s borders in Afghanistan and Kuwait. The report in the Journal indicates that the Pentagon wants the military buildup in the Gulf in place by autumn, when Pentagon planners anticipate that Israel will launch an unprovoked military strike on Iran. High-level discussions on Iran between Washington and the Israeli state are scheduled over the next several days, with Defense Minister Ehud Barak having left Israel Monday for two days of talks with US officials, and Israeli Prime Minister Benjamin Netanyahu set to hold talks with Obama on March 5. There are indications that a heated debate continues over whether to supply Israel with these 30,000-pound weapons, which are substantially more powerful than the 5,000-pound Guided Bomb Unit 28 (GBU-28) bunker busters that the Obama administration transferred to the Zionist state last year. In other words, behind all of the hyped warnings about Iran’s imminent acquiring of nuclear weapons, the reality is that US imperialism and its allies are engaged in a campaign of economic, political and military aggression against Iran, whose aim is to prevent the country from emerging as a regional power capable of challenging Washington’s hegemony over the energy-rich regions of the Persian Gulf and Central Asia. The nuclear issue has been used as the pretext for preparing a new war in the region, just as the claims about “weapons of mass destruction” were employed in the run-up to the US invasion of Iraq in 2003. Just as in Iraq a decade ago, the International Atomic Energy Agency’s nuclear inspection regime serves as a cat’s paw in preparing imperialist aggression. As in Iraq, the IAEA, manipulated by US, Israeli and Western European intelligence agencies, is demanding that Iran do the impossible: prove a negative, that it is not engaged in the development of nuclear weapons. And, similar to its operations against Baghdad, the IAEA is provoking Tehran by demanding that it submit to diktats that are in no way required of signatories to the Nuclear Non-Proliferation Treaty. Thus, the IAEA issued a report last Friday, stressing that a small amount of uranium metal was missing from a nuclear research site—far less than would be needed for building a bomb—and that Iran has increased its enrichment of uranium, not to the grade necessary for weapons, but rather for nuclear power plant fuel, perfectly legal under the treaty. It also charged that a team it sent to Iran was denied permission to visit the Parchin military complex, located about 18 miles southeast of Tehran. The US has repeatedly incited the IAEA to demand inspections of the site, which is a non-nuclear facility and not subject to the agency’s oversight. Between 2004 and 2006 Iran allowed inspectors into the sensitive facility after Washington charged that a bunker there was being used to test explosive triggers for nuclear bombs. The inspections found nothing of the kind. Iranian officials, who have insisted that the country’s nuclear program is for peaceful purposes, said that the IAEA team sent to Tehran was there to negotiate a “framework” for continued collaboration between the agency and Tehran and that it was not composed of nuclear inspectors and had no right to request entry to the Parchin facility. 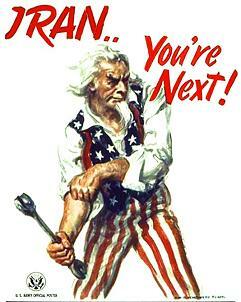 Both Israel and the US seized upon the report as the pretext for escalating pressure against Iran. Netanyahu issued a statement saying that it “provides more proof that Israel’s estimations are accurate, Iran is continuing with its nuclear program unchecked.” Israel itself has refused to sign the Nuclear Non-Proliferation Treaty or accept any IAEA oversight of its nuclear facilities, which have produced an estimated 400 nuclear weapons. “Iran’s actions demonstrate why Iran has failed to convince the international community that its nuclear program is peaceful,” White House spokesman Tommy Vietor said. Unless Iran submitted to US and Western European pressure, “its isolation from the international community will only continue to grow,” he added.